A fun and stylish way to commemorate your wedding is with a special, personalized gift for your bridal party: inexpensive bridesmaid robes from Robemart. Make your bridesmaids feel luxurious and pampered when they get ready for wedding events in matching satin bridesmaid robes, a popular style for its silky soft feel and perfect amount of coverage. 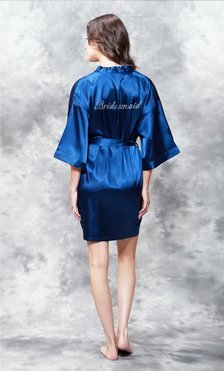 In a blissful marriage of premium quality and deeply discounted wholesale prices, our satin bridesmaid robes make a budget-friendly intimate gift for your bridal party that can be enjoyed long after you walk on the aisle. In fact, when our customers discover the premium quality of these bridesmaid robes, they are often surprised at the everyday low price. The durable fabric maintains its glossy luster wash after wash, which makes them easy to care for and even easier to wear for many years. Made with buttery soft satin fabric, these chic bridesmaid robes are lightweight and comfortable, which makes them the perfect cover-up for lounging and relaxing. The sleek, tailored collar stays securely in place while allowing for a comfortable amount of movement. The thoughtful design of these bridesmaid robes includes every detail for your comfort and convenience: a self-tie wrap, inside tie, and pocket for keeping small items safe and secure. The rhinestone detail in the back is emblazoned with the word “Bridesmaid,” giving this bridal party robe a playful style that is perfect for inspiring some serious bonding with the ladies. Layer it over nightwear for a luxurious loungewear set that is effortlessly stylish and cozy. Our bestselling bridesmaid bathrobes include elegant, classic black, pretty and feminine pink, and provocative, eye-catching red. Along with these popular choices, we also offer an exclusive range of trending colors, which makes it easy to coordinate your bridesmaid robes with a special color theme of your nuptials. At Robemart, we make it easy and affordable to personalize your robes with specially designed monogramming, which is available in embroidery, rhinestones, or vinyl printing. A favorite type of monogramming for bridesmaids, someone’s name or initials in glittery rhinestones adds a special touch of glam that will be cherished as a priceless keepsake. 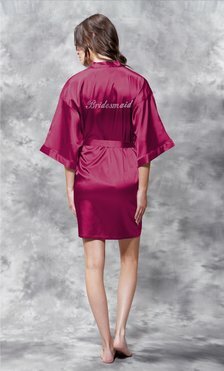 When you order personalized bridesmaids robes, your order will be shipped in three days for your convenience. At Robemart, our number one priority is providing our customers with an easy, streamlined shopping experience, including hassle-free exchanges and free returns as part of our customer satisfaction guarantee. We also offer shopping incentives like free shipping on orders of $150 or more and quantity discounts—the more you buy, the lower the price. Shop our collection of satin bridesmaids robes today and say “I do” to elegance and luxury at affordable prices.